We at East Boynton Dental are often asked a very common question. The question is something that comes up during an interview with a patient, when the patient contemplates having a tooth extracted that is hopeless. “Will my teeth shift around?” The quick answer is – yes! It may take an indefinite amount of time, but your teeth will shift and move. Teeth are in what could be referred to as a “dynamic equilibrium”. When the equilibrium is disrupted by a tooth extraction, teeth in front of the space created by the extraction will move backward and teeth behind the space will move forward. Also teeth from the opposing arch will super-erupt and move past the aligned “plane” of the other teeth and move into the space created by the extraction. “Nature” always tries to fill the void. As a consequence of this subtle shifting and tooth movement over time, the space created by the extraction “narrows” and there is the creation of an opening of one or more additional spaces elsewhere. As if this is not enough of a problem in and of itself. There is also another factor at play. Teeth are necessary to stimulate the development of the bone and to maintain the bone in which the teeth develop and are anchored. When a tooth, or teeth, are extracted there is a loss of stimulation of this bone to maintain its volume, height and even density. The rate of the loss of bone is dependent on but not limited to such factors as the gender of the patient, the age of the patient as well as the hormonal balance of the patient, the metabolism of the patient , etc. This aspect of the problem has been overlooked by dentistry in the past. This subtle, slow loss of bone, in the area of the extraction is often not considered. Yet the presence of adequate bone in breadth and height is vital to restore the tooth that was extracted. The patient was often not educated about the boney changes and the result of the loss of bone. Because adequate bone is “vital” especially if you were contemplating the placement of dental implant fixtures to restore form and function to the area where the tooth was extracted. 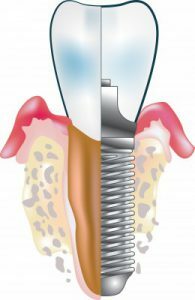 We at East Boynton Dental make it a point to inform and share with our patients all aspects of their care including an open discussion of the upside as well as the downside effects of the treatment that is contemplated. 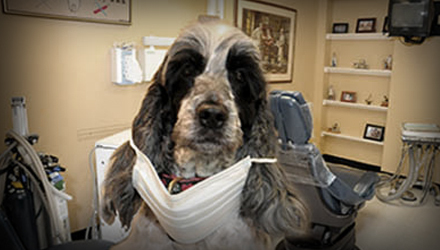 Doctor Indictor can make your teeth PAWfect. Make your next dental appointment today! 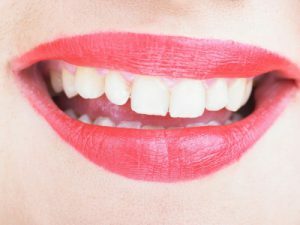 Consider Bleaching Your Teeth in Boynton Beach? Bleaching teeth or teeth whitening can be done using a number of different techniques. Teeth can be bleached as an “at-home” technique. In this method impressions are made of the patient’s teeth to be whitened. Models are retrieved from the impressions and custom made rubber trays are fabricated from the models. The peroxide gel is loaded by the patient into the trays and the trays are then inserted into the mouth and worn by the patient. They can be worn for as little as 2 hours or for an entire night of sleep depending on the formula of the peroxide gel. There are also companies that manufacture generic trays for “at-home” bleaching which are pre-loaded with the peroxide gel. Just pop open the package and insert them right into your and onto your teeth. These are less expensive but meant more for someone with no crowding of there teeth and orthodontically ideal. Another “at-home ” technique involves applying flexible strips pre-loaded with peroxide gel. The whitening strip is removed from its packaging and applied to the teeth. The strip is worn from as little as 2 hours to 8 hours (over-night). This is a technique best suited for someone whose teeth are not ideally aligned. However, the strip usually is only long enough to cover just the front teeth. This method has been researched the most. Other “at-home ” techniques include painting the peroxide gel onto your teeth directly from a pen. You could also brush your teeth with whitening toothpaste that contains peroxide as an ingredient or rinse your teeth with a peroxide containing mouth rinse. These latter methods have varying degrees of success. Ultimately the greater the degree that teeth are exposed directly to the peroxide gel, as well as the length of time that they are exposed to the peroxide gel will effect its efficacy at whitening the teeth. The last technique is an “in-office” technique. It was a technique that was utilized on the ABC Television Program “Extreme Makeover”. This is completed in an dental office setting. The face, mouth and oral soft tissues are prepped and draped. The peroxide gel is applied to the teeth and a collumiated beam of intense visible light is aimed at the teeth for a period of 15 minutes. The light does not activate the chemistry of the peroxide gel via some photochemical reaction. Rather the heat generated by the light beam fosters the bleaching process. At the end of the initial 15 minute segment the bleach is washed off and fresh gel is then applied to the teeth and again exposed to the light source. The process is then repeated again for a total of three 15 minute segments. This is a stand alone technique; once completed its not necessary to repeat the entire process to touch up or re-whiten your teeth. No matter which technique chosen the lightened tooth color achieved will revert to their original shading unless they are “touched up” every 6 – 12 months. We at East Boynton Dental have a very good understanding of teeth whitening. Just ask us! We will be more than happy to discuss it with you. East Boynton Dental: bring the kids! Looking for a family dentist in Boynton Beach? East Boynton Dental is an AKC Dental Office…. ALL KIDS CAN COME here for dental care! I can fetch almost anything! 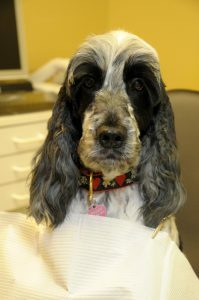 Call us for a dental appointment and we will fetch a convenient time for you!